Justin Arenstein, strategist with the Africa Media Initiative, says data journalism can fill gaping holes in information accessibility and allow people to connect with the news more freely and easily, as it has in Africa. “People aren’t swamped with information [in Africa]. It’s the reverse, they don’t have enough information,” he says. 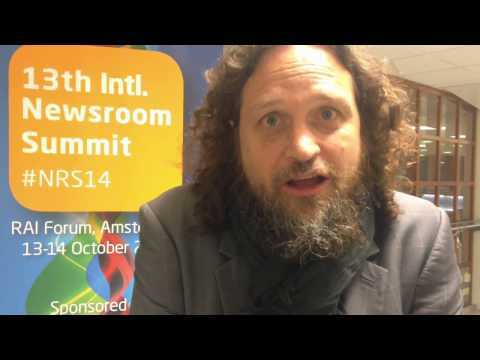 Arenstein told the International Newsroom Summit about his work with data journalism, which has allowed the public to mine information and understand how it affects their everyday lives. He told WEF’s Julie Posetti about one of his recent projects. “The leading cause of death in rural Africa is water-borne diseases…you’re drinking it out of a river, a downstream-of-sewage kind of problem. So we’re using the cameras in phones to build microscopes that can magnify and then analyse the contaminants in water, specifically looking for the things that cause cholera, E. Coli and various others. “[We’re] then sending out an SMS to locals, who are invariably women, whose job it is to walk and fetch water from the river, telling them when it’s contaminated, when it’s at dangerous levels, and give them options to go somewhere else that’s clean. "These are the kinds of resources and analysis that not even governments are capable of doing at the moment with the problems that they face … the reality is people are drinking from these rivers multiple times per day. We’re looking at doing this with a small budget with devices that could be built in any country, by any newsroom, resulting in data that any newsroom would be able to analyse and turn into stories." “I'm not a coder, I'm a words person and an editor,” Tomlin said, “but it is impossible for me as an editor of a newspaper to say you must use these tools if I don't know the value of them and how they work … New tools make [data journalism] so much easier to do."